A pH meter can measure the acidity and alkalinity of a substance. It is represented on a scale from 0 to 14. A pH value of 0 corresponds to an extremely acidic product, and a value of 14 corresponds to an extremely alkaline product. The pH of most bakery products ranges from 3.5 to 8.0. Certain pathogenic bacteria (those responsible for foodborne illnesses) cannot survive in acidic environments. In such cases, acidity plays a vital role as a preservation or inhibition mechanism, as in the case of sourdoughs. Low pH values in products (4.0–5.5) inhibit the growth of bacteria and mold. For example, rope (Bacillus subtilis spores) in doughs or breads cannot grow with pH values between 5.4 and 5.5. During fermentation (alcoholic and/or lactic), there is an increase in dough acidity (lowering of pH), which contributes to the shelf life, flavor, color, and rheological properties of the product. 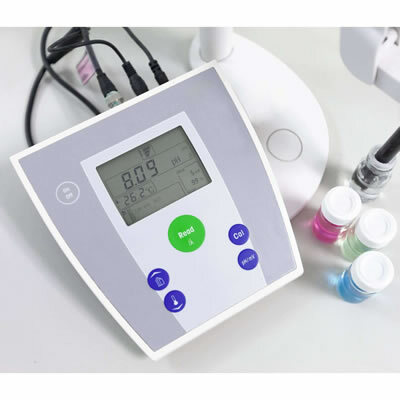 The pH value of any product can be measured by placing a pH meter device in direct contact with the product (previously prepared), or can be obtained quantitatively by following a math expression. Prepare 100 mL of deionized water. Place 15 g of product sample into a blender with the water. Thoroughly blend mixture for 10–30 seconds. Pour it into a beaker to measure the pH with the potentiometer (pH meter). [ ] means molar concentration of ions (in moles per liter or Molar). pH is represented on a scale from 0 to 14. The neutral point, pH 7.0 (value of pure water), is the midpoint of the pH scale. A pH of 0 indicates extreme acidity, and a pH of 14 extreme alkalinity. pH is a logarithmic value. H3O+ molar concentrations progress arithmetically, but each unit increment of pH indicates a tenfold increment in H3O+ concentration. Cauvain, S.P. “Testing Methods.” Baking Problems Solved, 2nd ed., Woodhead Publishing Limited, 2017, pp. 469–470. Nielsen, S.S. “Standard Solutions and Titratable Acidity.” Food Analysis Laboratory Manual, 3rd ed., Springer International Publishing, 2017, pp. 179–184. Cauvain, S.P. “Other Ingredients.” Baking Problems Solved, 2nd ed., Woodhead Publishing Limited, 2017, p. 109. Cauvain, S.P. “Cakes, Sponges and Muffins.” Baking Problems Solved, 2nd ed., Woodhead Publishing Limited, 2017, p. 277. Edwards, W.P. “Science.” The Science of Bakery Products, The Royal Society of Chemistry Publishing, 2007, p. 13. Timberlake, K. “Acids and Bases.” Basic Chemistry, 5th ed., Pearson Education Limited, 2017, pp. 490–496.